Nothing illustrates this better than our collective reaction to The Dress. It’s the perfect example that shows people have not only radically different perceptions but different realities. When I was a kid, I was fascinated – and sometimes paralyzed – by wondering whether, when other people said the sky was blue, they saw the same colour I did. I mean, yes, we all say it’s “blue” but…are we all seeing the same thing that we’re calling blue? What if what I call blue is really what someone else calls green? Like most people, I originally saw The Dress as white and gold/mustard (if we’re talking Dijon and not French’s), then as periwinkle and gold. I didn’t doubt that other people saw something different, but I could not, for the life of me, figure out how anyone saw black — and I thought “blue” was stretching it a bit, considering how pale it was. I saw black patterns in the background of the photo, so I knew my ability to see black wasn’t hindered. The whole cone-theory made sense, and I was briefly sad that the world apparently contains far more royal blue than my eyes are capable of seeing (it’s my favourite colour). I’m curious about neurology and have a basic understanding of photography, so I downloaded the original photo, opened it in Preview (periwinkle and gold-ish) and increased the contrast – a lot. And suddenly, the white parts were royal blue and the gold parts were black. Totally like the picture of the dress as it was on the woman who wore it. I looked at the image I had in Preview. Blue and black. I opened my Messages app, where I’d texted the white-and-gold image to a friend. Blue and black. I squealed (and yes, I once again clapped my hands over my mouth). It blew my mind. 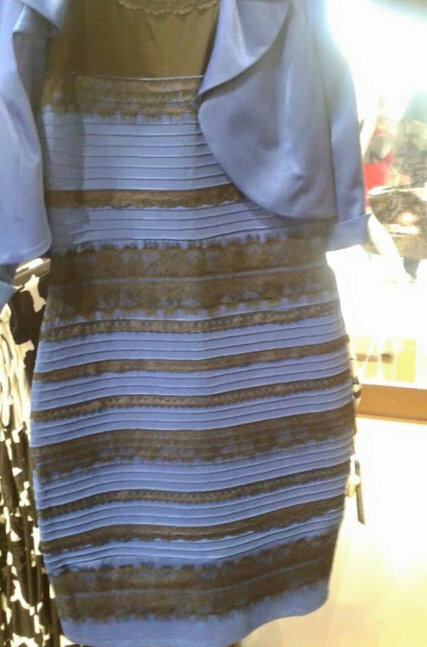 Since then, The Dress has appeared to me both ways – including in the image for this post – seemingly changing colours randomly. I can’t make it go back and forth; it’s not an optical illusion; it’s two completely different sets of colours. I don’t know why it happens, but it’s a stunning thing to experience once’s visual processing shift like that (it’s actually super-amusing, or maybe that’s just me). I briefly wondered if my black cat has been a gold tabby all this time. What has struck me, though, is how passionately everyone who sees The Dress one ways insists that they are right – and people who see it the other way are wrong, wrong, wrong, wrong, wrong. There is only room for one reality in our minds, and it’s our reality – anyone who experiences anything else is labeled ‘crazy’. Yet here we have this amazing, awesome lesson: Multiple realities can (and do) co-exist. The thing is, as a culture, we’re much more interested in making ourselves right and making other people wrong – in strengthening our individual egos rather than accepting that there are things our limited cognitive minds can’t understand. There are realities we can’t access, but that doesn’t make them any less real for the person experiencing it. After my “rapture” experience, I started hearing song lyrics completely differently – same words, much more profound, even mystical meanings; it was as though I’d always been hearing one version, and then with this new insight, these alt-rock-pop songs suddenly had much, much deeper insight into the workings of the universe – possibly ones the songwriters didn’t even intend. Every single person believes that their interpretation of “reality” is the correct one. And to that person, it is. Some people have extra cones in their eyes and can see up to 100 million colours the rest of us can’t. But just try imagining a colour you’ve never seen – I don’t know about you, but I can’t do it. Yet their reality is a much, much more vivid world than I will ever know (sigh). There’s another side to this. Beyond neurology, whatever we believe is reflected back to us (whether you call it confirmation bias, neuroplasticity or Law of Attraction, it’s the same thing). People who see themselves are unlucky are less likely to notice a $50 bill on the ground. People who think the world is cruel will hyperfocus on the cruelty of the world, even as someone holds the door open for them. Those who see a white dress can’t imagine that it might be blue – literally because our brain isn’t primed for it. (I suspect I can see both because I set that expectation in my brain, and the colour cones responded accordingly – but I can’t will it from white to blue). Every single one of us has a different experience of the world, but to most of us ours is the only one. One of my most challenging (and rewarding) practices is learning not to make myself right and other people wrong. It’s super-easy to fall into this pattern (and it’s our cultural default): He should do this, she shouldn’t do that. But I’m not in their shoes. Their actions or inactions are their business. My response is mine. My task is to focus on my life. Just because someone acts in a way that’s unfamiliar or uncomfortable to me doesn’t make them wrong. Just because they literally see something (or hear something or interpret something) I don’t, doesn’t make them wrong or crazy. Everybody takes actions based on their personality, culture, neurology and circumstance (among other things) – and all those things vary widely. We all do what we think is the best thing we can do in our circumstances. We all handle situations in our lives to the best of our ability in each moment. Everybody, as Buddhists say, is struggling with things that you will never know about. And now we know, too, that everyone’s perceptions are different.